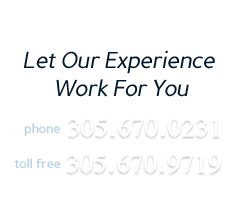 Attorney Profiles, Miami Personal Injury Attorneys, Florida Injury Lawyers - Stokes & Gonzalez, P.A. MARK L. STOKES has been practicing law in Florida for the past 28 years and is a founding partner of the law firm of Stokes & Gonzalez, P.A. in the year 2000. He is a 1979 graduate of Florida International University’s School of Arts. Mark obtained his Juris Doctorate from the University of Miami School of Law in 1983. Mark has been admitted to the Florida Bar since 1983. He is also admitted to the United States District Court Southern District of Florida. He is AV rated by Martindale Hubbel. JACINTO J. GONZALEZ has been practicing law in Florida for the past 19 years and is a founding partner of the law firm of Stokes & Gonzalez, P.A. in the year 2000. He is a 1987 graduate of Florida International University’s School of Business. Jacinto obtained his Juris Doctorate from the University of Miami School of Law in 1991. Jacinto has been admitted to the Florida Bar since 1992. He is also admitted to the United States District Court Southern District of Florida. He is AV rated by Martindale Hubbel.